These are trying times for Nigerian music star, Daniel Oyebanjo, aka D’banj, who has lost his son, Daniel Jr. 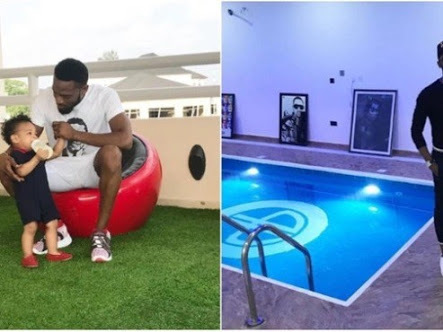 The 13-month-old boy reportedly drowned in the singer’s home in the Ikoyi area of Lagos during the visit of some friends of the family. D’banj was said to be away for a musical award in Los Angeles, United States, when the incident happened. The singer, who had yet to make any official statement, posted a cryptic message on his Instagram page on Sunday, which many of his followers, including celebrities, saw as a confirmation of the news. The post was greeted with a flood of condolences from celebrities and fans. The senator representing Bayelsa East Constituency, Ben Bruce, asked D’banj to take heart. “@iamdbanj, I am really sad to read about the death of your lovely son. Death of a child is the saddest thing for any parent. On behalf of my family and I, please do accept our sincerest sympathy,” he wrote on his Twitter page. Aside the senator, other artistes who offered him condolences were Tiwa Savage, Michael Ajereh (Don Jazzy), Folarin Falana (Falzdbahdguy), Funke Akindele, Olamide Adedeji, Omotola Ekeinde, Jackiah Appiah, Genevieve Nnaji, Peter Okoye (PSquare), Olubankole Wellington (Banky W) and Toke Makinwa, among others. Lagos state Police Public Relations Officer, CSP Chike Oti, in a statement, said the state CP, Edgal Imohimi, was saddened by the death. He said, “The Commissioner of Police, Lagos State, Edgal Imohimi, on behalf of officers and men of the Lagos State Police Command, wishes to commiserate with the family of Mr and Mrs Oladapo Daniel Oyebanjo aka D’banj, on the death of their one-year-old son, Daniel (Jnr) Oyebanjo… The entire command shares their pain.